Zero Tolerance Knives for sale are functional combat knives. Zero Tolerance knives are built for military use and feature Ken Onion designs. Buy popular fixed blade and folding styles all on sale now. Zero Tolerance Knives for sale include this locking liner. The assisted opening Zero Tolerance 0350TS Knife features a tiger stripe on the high performance, corrosion and wear resistant blade. These liner locks are opened with a SpeedSafe assisted opening system and an ambidextrous flipper. They are made in the USA. They are 7.6 inches in all and 4.6 inches closed. They have a total weight of 6.2 ounces. The 3.25 inch blade is made with S30V stainless steel and has a Tungsten Diamond Like Coating (DLC). This Tungsten DLC coating increases the hardness of the blade while reducing friction. 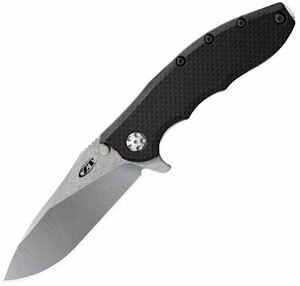 The matte black colored handle has flat textured G10 scales. They have a quad mount clip (tip – up or down);(left or right). They also feature a functional lanyard hole. 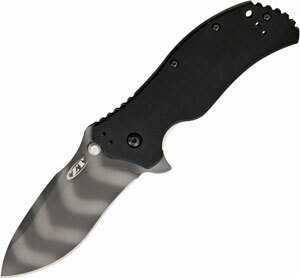 Buy the assisted opening Zero Tolerance 0350TS for $159.99. Zero Tolerance 0452CF Knives for sale include this frame lock. The manual opening 0452CF was born from a collaboration between Zero Tolerance and Dmitry Sinkevich to create a functional carbon fiber front scale knife. They are 9.3 inches in all, 5.2 inches closed and weigh 4.6 ounces. The 4.1 inch blade is made with S35VN steel with a stonewashed and satin dual finish. 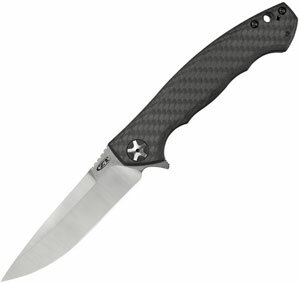 The handle has a carbon fiber front, titanium back and stonewashed finish. This frame lock features a built in flipper and KVT ball bearing system for manual opening. Solid lock up is achieved through the titanium framelock with hardened steel lockbar insert. They have a reversible, left – right, deep carry clip. The 5 spoke pivot hardware provides an elegant touch. Buy the Zero Tolerance Sinkevich large frame lock knives for $219.99. Zero Tolerance Hinderer Slicer 0562CF Knives feature a stonewash finish flat ground blade. They are 4.88 inches closed. The 3.5 inch blade is made with S35VN steel. The handle is a black carbon fiber with stonewash finish titanium. Knife has a thumb stud as well as a thumb pull along with a KVT ball bearing opening system. Buy this Zero Tolerance knife made by Rick Hinderer for $259.99.